A new after school snack for the kids with a seasonal flavor! My kids are always on the lookout for new recipes for me to try. They read magazines, pour through cookbooks, and even check the backs and sides of cereal boxes, always looking for the next great recipe. They love it when they find out that I’ve tried “their” recipe. I love surprising them. 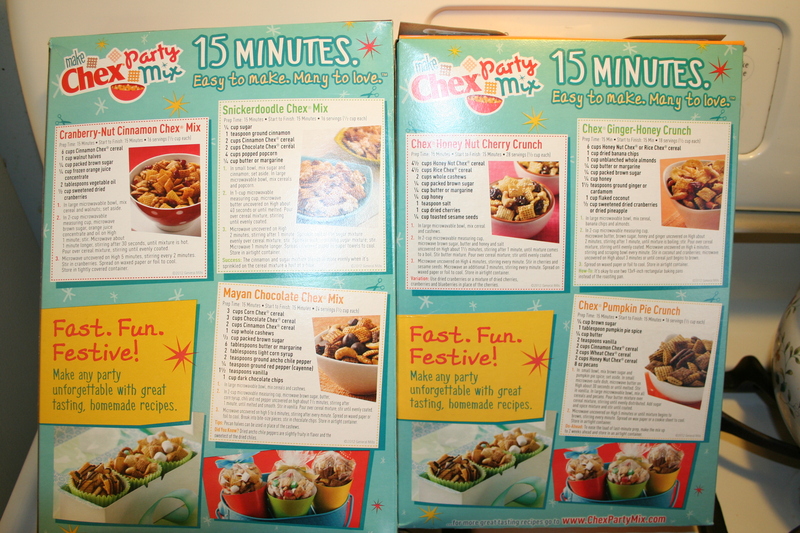 Most recently, Elizabeth stumbled on the jackpot: a Chex cereal box with three recipes on the back of the box. She found one she wanted me to try, and it had a seasonal flavor to it, just in time for Thanksgiving. One Monday afternoon I decided to give it a try because I had everything I needed on hand with the exception of one type of Chex cereal. It called for three different kinds and I had three, just not the exact three. You’ll see what I mean in my notes below. Lots of recipe options to choose from! The other thing I liked about this recipe, besides the fact that it was fast, is that it was a microwave recipe. No need to preheat the oven. In just five minutes in the microwave, it was done. Here is the recipe for you to try too! This one was found on the back of the Honey Nut Chex cereal, which also happens to be gluten free. Three bowls of ingredients: cereal, spices, liquids. Make sure your bowl is big enough and is microwave safe! 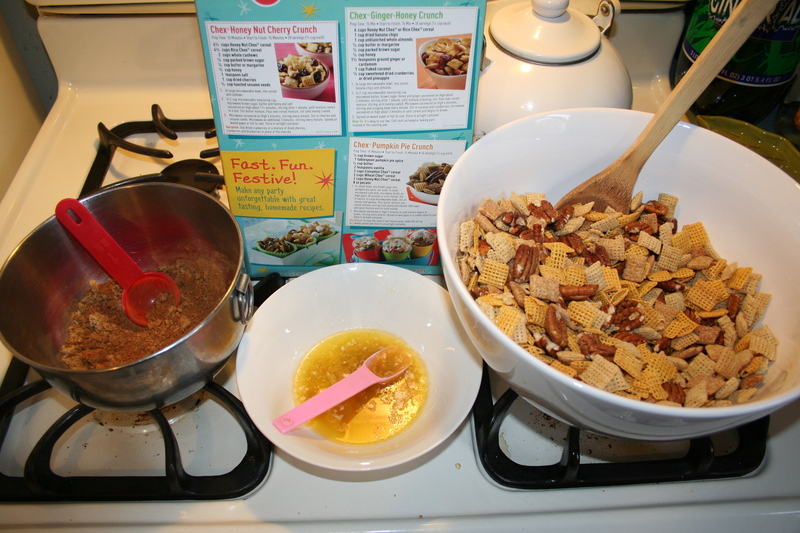 1) In small bowl, mix brown sugar and pumpkin pie spice; set aside. 2) In small microwave-safe dish, microwave butter on high about 30 seconds or until melted. 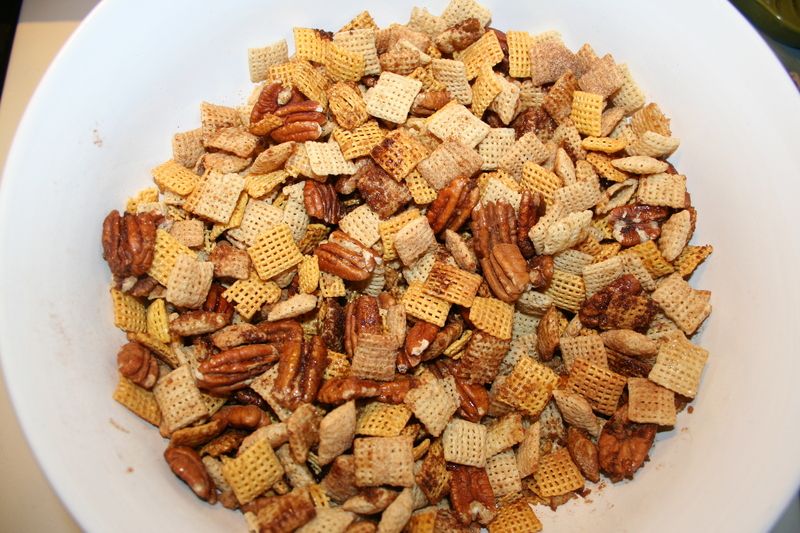 4) In large microwave bowl, mix all cereals and pecans. Pour butter mixture over cereal mixture, stirring until evenly distributed. 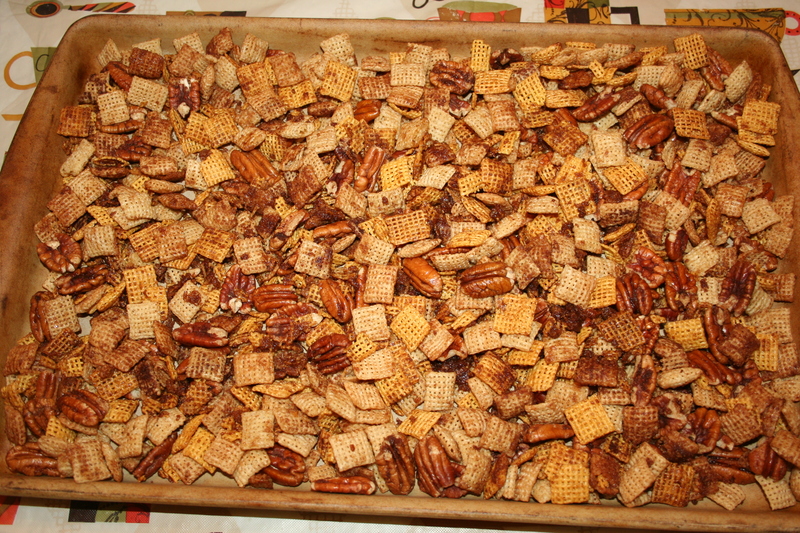 5) Add sugar and spice mixture and stir until coated. 6) Microwave uncovered on high 5 minutes or until mixture begins to brown, stirring every minute. 7) Spread on wax paper or a cookie sheet to cool. WOW ! I totally want to make this NOW! Thanks for sharing.